A mark of becoming a mature nation-state is having several writers flood our schools, homes, libraries, and work places with our literature –fiction and non-fiction, textbooks, novels, poems, etc., etc. 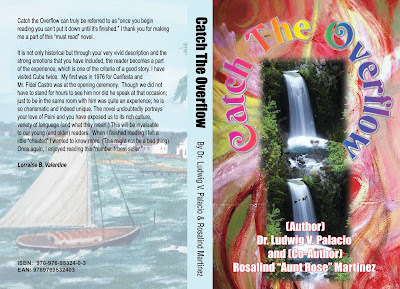 Catch the Overflow, an autobiographical compilation, is certainly a most welcome contribution to a growing collection of works written by Belizeans about Belize. Coming from the proverbial “forgotten district”, this book vividly broadcasts that Toledo is no longer forgotten but has truly become the unforgettable district, as Rob Hirons of the Lodge at Big Falls has always reminded me. Indeed, other Belizeans may not be aware that Toledo has been steadily increasing its list of publications. The author of Catch the Overflow himself has written a book of poetry – Sugarosi, 1998, several plays and a movie script Agada, 2006 each covering different aspects of the rich cultural landscape of this beautiful district. Other local writers include: Bismark Ranguy Sr. Toledo Recollections, 1999, Govel Morgan Jr. Southern Children, 1993 and Anigi, 1999 Elroy Johnson, Ah Baan Deh, 2009 and Geraldo Baltazaar, Broken Dreams, 1998. But the uniqueness of this one over the others comes from the unique style of the author together with its cross-regional and transboundary scope. Reflecting the true meaning of its title, this book is literally an overflow of stories put together into twenty-two chapters. The author’s infectious style of weaving a tale to catch the interest of his reader left this reader asking for more on reaching the last chapter. Each chapter reveals one or more basic human characteristics often with a good dose of humour as a punch line. As a result, one is entertained while learning about the physical environment of southern Belize, the rich cultural tapestry that ties together people representing several ethnicities, while following the author as he travels from Punta Gorda to Belmopan to Belize City, and away from Belize to Cuba and back to Belize. The thread that pins the whole work together is the passage of the author from being a toddler in San Antonio to growing up as a boy in Punta Gorda, to a young man going to attend high school in Belmopan, and eventually taking up university studies in Cuba as an adult. Because of the focus on the youthful phase of the author’s life, the book lends itself to the young reader, who might be reading it as a textbook or for the fun of learning from the author’s experiences. But the book captures some human values that are so universal that we need to be constantly reminded of them. They include pulling oneself by the bootstrap from the difficulties of poverty by the petty trading of foodstuff; not being afraid to stand by one’s conviction even when others are quickly walking away; cherishing a deep appreciation for the several types of persons that make up one’s home community; and, most of all, seeing humour even at the darkest of times and being able to share the joke with others. Ubafu Sanchez Satuye is not producing a code of moral social behaviour in sharing his life story with the reader. There is, however, an underlying theme of social justice in his encounters. A good example was his feeling of sympathy on seeing for the first time the derelict homeless persons in Belize City. A second example was his refusal to apologize about a high school incident when he was convinced that he had done no wrong. A third example is his deep affection for his mother, who promoted him to be her home business partner at the tender age of eight. Her role in forming Ubafu’s strong moral fibre is undisputed. From the larger socio-political terrain the book captures some significant moments in our movement toward independence in the late 1970s, putting on them Ubafu’s inimitable stamp. We see the initial stage of populating the new capital city of Belmopan. More especially, among those moving in were not only public officers but also poor people from Punta Gorda, who were looking for more opportunities for themselves and their children. There was the civil unrest prior to independence when Ubafu cut his politically rebellious teeth in organizing his high school to join the public parade around the issue of independence. Around the same time Belize was entering into bilateral exchange relations with Cuba, now accepted as normal, but at that time had to be clandestine. In short, Catch the Overflow starts as a series of stories taking place in Toledo. The painting that the author sketches for his reader gradually takes place on a canvas that extends to the rest of Belize, bringing in bits and pieces that are found as far away in Cuba and in other parts of the world. It fits on the bookshelf of all homes in Belize and wherever Belizeans find themselves. 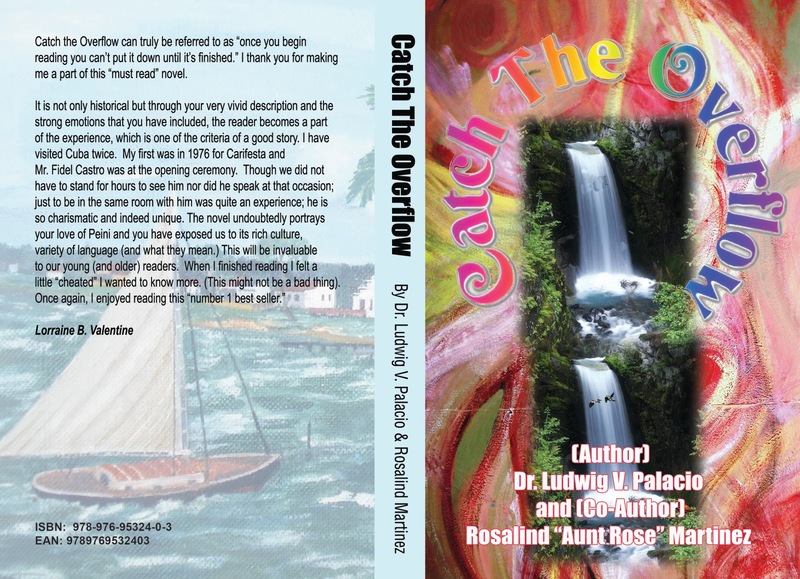 Catch the Overflow is also a book that is inherently Pan-Caribbean, tying together the English and Spanish-speaking portions of the region; it is a Third World story in depicting stages of building a national identity within a colonial society; finally in projecting some underlying human values it has a universal appeal. A work that started off in Toledo can also reach for the stars within the region and beyond. This Book I s A Very Interesting Book For The Elderly,Young,Middle Age And Also The Children.. I Highly Recommend This Book And I'm Proud To Actually Know The Author Of This Book..Great Job Dr.Ludwig Palacio!!! God Bless And Much Love To You And Your Family!! !